An Angolan deportee was heard by air passengers to cry out "you're killing me" as he was pinned down in his seat by G4S security guards, a jury heard. 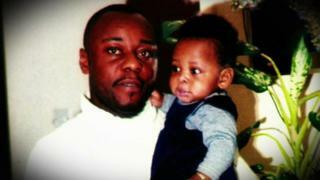 Three G4S guards killed Jimmy Mubenga, 46, as they restrained him on a flight from the UK, the Old Bailey was told. Colin Kaler, 51, from Bedfordshire, Terrence Hughes, 53, from Hampshire, and Stuart Tribelnig, 38, from Surrey, deny the manslaughter of Mr Mubenga. He died as a flight prepared to leave Heathrow for Angola in October 2010. In an unprecedented move, a section of the Boeing 777 with three rows of three seats has been specially constructed inside Court 16 of the Old Bailey to demonstrate to the jury how Mr Mubenga died. The security guards ignored his desperate pleas and "disregarded their duty of care" by assuming that the married father was "feigning" illness as the British Airways flight prepared to take off, jurors were told. Prosecutor Mark Dennis QC told the court: "As the man boarded the plane, accompanied by the three Group 4 Securicor (G4S) guards, Mr Mubenga, who left his family and children in the UK, had been "fit and healthy" and "thoroughly co-operative", Mr Dennis told the court. He said that a few minutes after boarding, Mr Mubenga was returning from the lavatory, still accompanied by the three officers, when all four became "embroiled in a commotion which quickly escalated into a physical struggle" as the officers tried to force him to sit down. "He was then further restrained by the application of rigid handcuffs with his arms, hands bound in that way behind his back and his seat belt being applied around his waist thereby holding him into the seat," he said. He said such physical restraint should have been enough to hold Mr Mubenga in his seat and make him realise there was no point in struggling further. One officer sat either side of Mr Mubenga, with the other leaning over from the seat ahead, and between them pinned him into his seat, Mr Dennis said. "In doing so, they held Mubenga in such a position bent forward that his ability to breathe properly was inevitable impaired," he said. "Each officer would have known from their training and from common sense that keeping someone in such a position was likely to cause a person harm yet they did so over a prolonged period and did so ignoring shouts from Mubenga that he was in trouble - 'I can't breathe' shouts that were heard by many a passenger seated further away. "His shouts that he was unable to breathe were disregarded." Mr Mubenga shouted out: "Please let me go, I want to see my family... you're killing me. Please help," the court heard. Mr Dennis said while Mr Mubenga was seated motionless and "simply staring open-eyed ahead of him", the officers appeared to have "disregarded their duty of care" and assumed he was feigning his condition. He said it was only when one officer realised Mr Mubenga was in a critical state that the "medical emergency" was reported to the control tower. "By then, however, Mubenga had almost certainly already suffered a cardiac arrest and was, in all likelihood, beyond recovery as sadly proved to be the case." The whole incident lasted 35 minutes, the court heard. Mr Mubenga was an Angolan national who had been living in the UK for a number of years with his wife and children, the youngest of which was a few months old, the court heard.